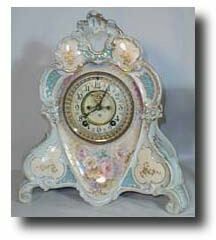 "Ansonia " LA ROCHE" Royal Bonn China Clock , circa 1900 Perfect condition. Case: One of the most beautiful of all the Royal Bonn China cases. 13.5" tall. Heavy beveled glass. Works: Ansonia 8 day time and strike on gong. Reference: Ansonia Clocks by Tran Duy Ly Condition: Case - Excellent, no chips, no repairs; Works - Excellent.